I recently had my heads rebuilt and after running the vacuum system and setting proper timing, my car isn't starting. I have fuel and spark. Any ideas as to what may be causing this issue? I found I missed two vacuum lines, does anyone know where these attach? This is on the driver side of the engine bay just on the strut housing. The vacuum hose looks long enough to run across to the passenger side. This is on the passenger side of the engine bay. Just behind the strut housing next to the firewall. I have no idea what these two parts are. sorry can't see your pics. Does it try to fire or just crank over? Your photos aren't showing up, but sight unseen I'd see if the passenger side might hook in at the back of the intake manifold below the throttle position sensor. As for the driver's side, could it be one that hooks into your intake piping just after the MAF? I found the proper vacuum diagram for the later 86 CA20E here. I have that all sorted out. Still cranking, getting fuel and spark, yet it's not starting. I am now looking for the ECCS module to do the self-diagnosis. This should be fun. I thought it could be a possible ground fault, yet all ground wires are connected and in good condition. Any pointers from others that have ran into this problem would help. You were correct on all accounts bud. Thanks for the reply. I have fuel and spark. It is just cranking over. I know it has to be something with the ignition system. I thought a ground, but they all look good, clean, and intact. Sorry, can't help you with the ECCS. Hit the search bar in the top right corner of the site for that one. Did you take the distributor out at all during your initial repair? I'd yank that bad boy all the way out, triple-mega-check you've got TDC, re-insert and at least see if it SOUNDS closer. Does it sound like it wants to start at all? I've done that more than once. It was backfiring a bit, so that let me know my timing was off. Found TDC and corrected the distributor earlier. No more slight backfiring, now it is just continuously cranking. I replaced the distributor cap earlier as well because the points looked worn. I'm not too sure how to post pics on this forum. Here's a link to the pic of the coolant sensor. Hmmmm.... Does that mean you aren't getting compression in the cylinders? Make sure your valves aren't bass-ackwards in their open/close positions. Pull the distributor and give the engine one rotation by hand, landing back on TDC, slap it all back together and try that. Bet you'll at least get your backfire back. Such a valve condition had me off the road for two weeks. Found TDC earlier by doing just that. Compression was tested and is good. All cylinders are within 5% of each other and within the proper range. Shoot. That was my last internet magic bullet. Keep us posted as you continue messing with it. Every detail helps. Thanks for the help man. I appreciate it. 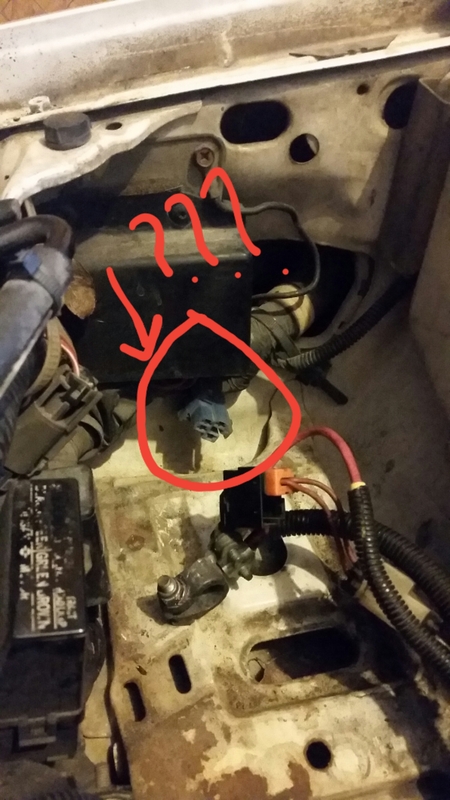 Not sure, but that coolant plug may be for an electric fan, looks like you don't have that. Or, my 85 originally came from chilly MT and had a plug in water heater mounted in one of the hoses, kind of looked like that. Had a 120v cord that plugged into it. The plug under the battery is probably not important. These cars come with a kind of one size fits all wiring harness so you will usually find a few plugs not in use. If you were getting backfire and now nothing, I would agree this is a timing issue like Kelso was talking about. Okay, that's what I figured about the plugs, the connections didn't look clean and used. After double checking the compression, the values are low across all 4 cylinders. I got a reading of 80 psi. These low readings could very well be the problem. Tomorrow I am going to pull the valve cover and retorque the head bolts to ensure they're set to proper specifications. I had a friend torquing the head bolts and recording the compression values. Time to redo the work. Sounds like your valves are not adjusted correctly. Don't think it's a head bolt problem. So a valve adjustment is in order? I'll have to look into how to do that. The rain here in SoCal has been crazy bad and delayed the work. That's where I would start based on your description. 86 has hydraulic valves, so likely not just a little "out of adjustment", but maybe way off with all low compression values. Follow FSM on resetting, there's a detailed way to do it. When the head was rebuilt I assume the valve train was removed? ?